This book was fast paced and extremly fun! Its great for anyone who has finished Cassandra Clare’s TMI series and needs something just as action packed. Whilst reading this book, I found myself thinking “I wish this would speed up and something interesting would happen” And managed to read it in one sitting. As this is the first book, there is a lot of descriptive writing for the world building but it’s done very well… And who doesn’t love a book set in london!? The Plot gets top points for constantly keeping me intrigued and not being completely generic. The characters in the book were great. You can have a fantastic plot but terrible characters and the book will be ruined, however this is certainly not the case with this series. The main character grows up around this world, but she’s never really in the know about it, and shedoesn’t jump straight into it, but is scared and confused which makes the book more relatable, as we often see characters being thrown into “supernatural” situations and becoming accustomed to it within 10 pages. So when Gwenyth, the protagonist is pushed into those situations she reacts in a normal human way. It was refreshing to have a character that admits that she doesn’t understand her surroundings but that she’s willing to try snd learn. I liked that the main character wasn’t stereotypically”perfect” as she had flaws but was still considered a heroine, where as her cousin Charlotte was considered to be “perfect” but turned out to be a right…. The love interest was a little unoriginal but it was enjoyable and consists of a “plot twist” in the later books. It wasnt too chessy and boring, and no love triangles ( thank the Lord of Cheese) so it was yet another great aspect of this book! Sapphire Blue picks up right where Ruby Red leaves off as the entire series takes place in the space of a couple of weeks which is pretty cool. Since it is the sequel, I didn’t have too high expectations and wasn’t expecting it to live up to its predecessor. 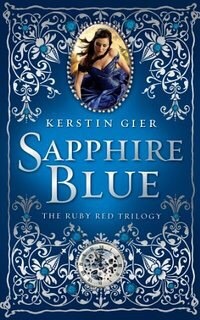 But I liked it even more that Ruby Red because of the great Character development and awesome plot line! I was flung back into the amazing humor and fast-paced plot. The characters were still enjoyable; and Gwenyth grew more of a backbone. In this book, Xemerius (a gargoyle/demon) comes into play and he was absolutely hilarious and the highlight of the novel as he wad able to make awkward sitautions amusing. My only issue was Gideon. He was so moody and treated Gwenyth badly which made me really frustrated. Sapphire blue left me craving for Emerald Green for so many reasons! The pace started out slow which put me off reading this for a while, but once things got going they never slacked, and so many secrets were uncovered that I just couldn’t stop reading! I was very satisfied with the character development—before starting it, I worried that Kerstin Gier would brush over important details about the minor characters but she didnt as each and every character was portrayed excellently. Overall, I didn’t enjoy Emerald Green quite as much as Sapphire Blue. 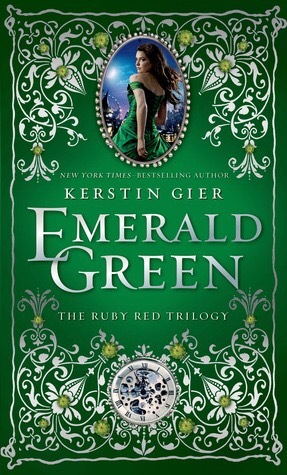 Emerald Green was a good conclusion to an epic series; it was a little rushed towards the end and their was a little bit of insta – love but overall it was a very enjoyable series that kept me both entertained and amused throughout all three books. I love pretty much any story involving time travel, and I like that the MC has a normal human reaction to the supernatural happenings–you make a really good point with that. How heavy is the romance factor in Ruby Red? It is a fairly heavy factor, but it ties in with the plot. I can’t really say more than that without spoiling it. 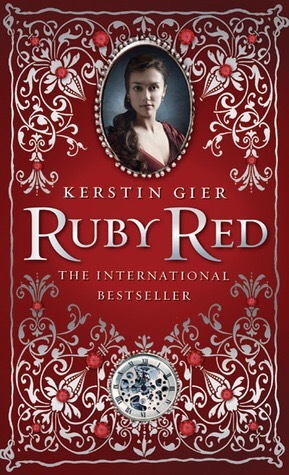 Alright, Ruby Red is definitely moving higher up my TBR list.